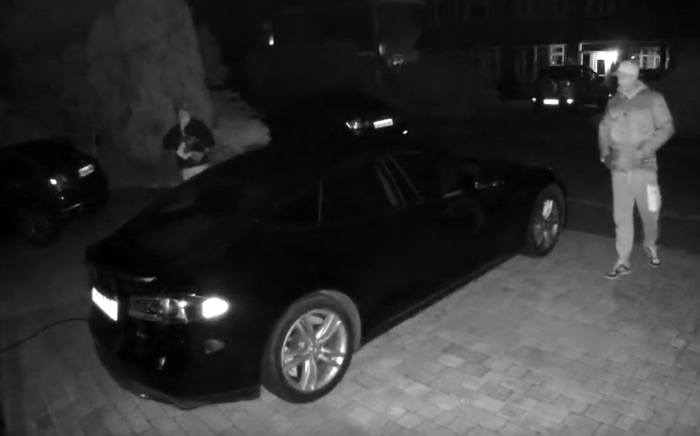 A pair of thieves have stolen a Tesla Model S by hacking the key fob on the car and this was all caught on video by the cars owner Anthony Kennedy, he has posted the video of the theft on YouTube to bring attention to the issue. In the video below one of the thieves can be seen going close to the front door of the house with a tablet to steal the information from the cars key fob, this is then used to unlock and start the vehicle. The tablet is used to capture the passive signal from the cars key fob which is located inside the house, Tesla has apparently recently introduced measures to stop this sort of thing from happening. The owner of the vehicle had not activated these as he said that the PIN to drive feature was not on. If you own a Tesla Model S then it is recommended that you use these features to stop this sort of thing from happening. Lets hope that these two thieves are caught and the owners Model S is returned to him.